Last weekend Birkenhead club members were competing at opposite ends of the country with the Marblehead ranking race in Poole and the DF TT series in Southport. The Poole event was the start of the qualifying for the World Championship in 2020 at West Kirby, and two members Bill Culshaw and Dave Potter made the long journey south. Bill had an excellent day finishing 6th including a race win and a 2nd and Dave’s new Starkers showed potential with a 2nd in one of the races. 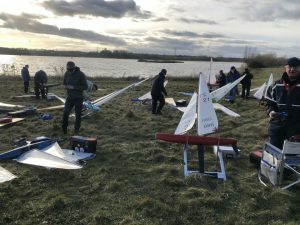 At Southport the DF club members of Alan Watkinson, Andrew Peters, Peter Baldwin and John Brierley arrived to find the lake frozen but after a delay of one hour the 35 competitors managed a good days sailing in A+ rig conditions. At the end of day one, John benefited from winning the last race to finish 3rd, with Peter in 7th and Alan and Andrew getting to grips with the A+ rigs as the day progressed. On the Sunday there was again another delay for thicker ice and as only seven races could be achieved, the fact of only one discard was to make the racing tight across the fleet of 35 boats. John was level on points with “Uncle Derek” but on count back had to settle for 2nd overall. Peter had a late charge to finish 5th and Andrew and Alan had close competition all day . Next weekend it is back to Gautby Rd for the next round of our Winter Series in IOM, Start time 1300. Come and join us at this Open Series.